In 1974, the Swedish pop group Blue Swede did a cover version, which included the "ooga chaka" introduction from Jonathan King's 1971 cover. Their arrangement was inspired by a bootleg recording of Do You Like Worms? from the unfinished album Smile by the Beach Boys. The Blue Swede version of the song also tweaked the lyrics to avoid a drug reference. This version reached number one in the United States. Billboard ranked it as the No. 20 song for 1974. 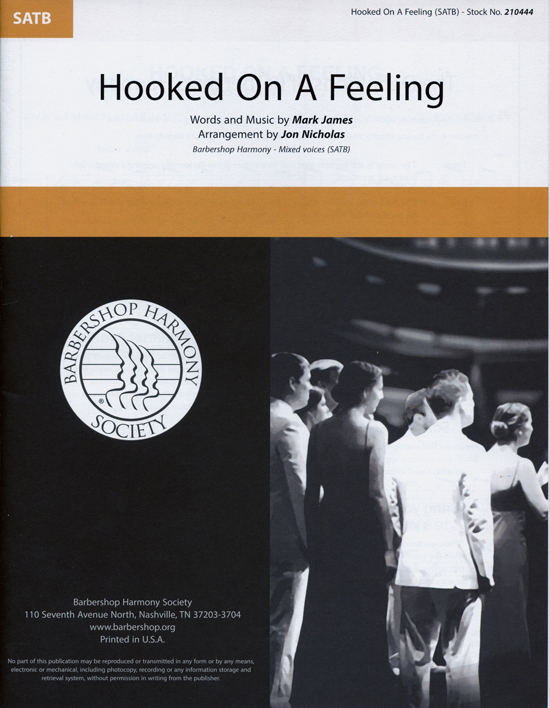 Hooked on a Feeling was written by Mark James and was a number one hit for pop group Blue Swede in 1974. The song has been revived over the years through television and movies most recently in the blockbuster film Guardians of the Galaxy. Perform this piece in the campy Blue Swede style, enjoying the fun-loving lyric and playful melody.